The transparency and detail resolution here are absolutely spectacular. Astonishing, really, especially in terms of natural instrumental attack. This is after all a rhythmic power trio. No other version I've heard comes close to expressing the speed and precision of La Faro's playing—the clarity and finesse with which he attacks the strings. The same is true of how the mastering and one-step plating capture Evans'and Motian's playing.Assuming your system can do it, anyone who has been to the small basement venue that is The Village Vanguard will feel as if they are traveling through time and seeing into the space. I doubt Mobile Fidelity made a "killing" here, though they've produced a killer reissue! f you had a time machine with the ability to project you into the past, how would you use it? Forget about going back and changing history. Anyone knows that such meddling would disrupt the time-space continuum and create more havoc than good. Let’s say you can only travel backwards and watch history unfold. One of the dates I would likely set the time machine for is June 25, 1961. 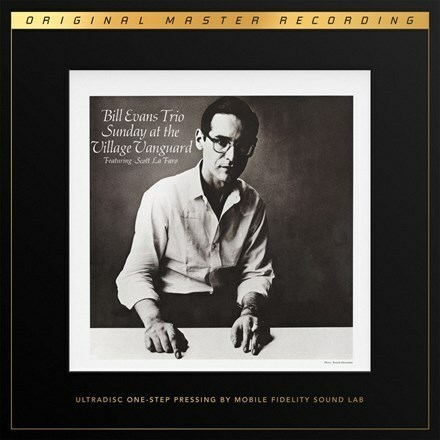 The place would be New York’s Village Vanguard jazz club, and the purpose would be to hear this historic performance by Bill Evans on piano with bassist Scott LaFaro and drummer Paul Motian. Originally released as Riverside 376 (mono) and 9376 (stereo) and followed by its companion album from the same sessions, Waltz For Debby [Riverside 399/9399], Sunday at the Village Vanguard came to define jazz-trio playing. It’s difficult to think of many jazz LPs where the players seemed to anticipate each other’s direction with such telepathic suasion. It was never to be re-created with the same trio, because LaFaro died in an auto accident days after the sessions. Most people change the LPs on their desert-island list from one day to the next, as mood changes, but it’s hard for me to think that Sunday at the Village Vanguard would ever drop off my list. How could I replace perfection? The Audio Beat Sound 5/5 - I’ve owned many copies of the original mono and stereo LPs, as well as the later Orpheum Productions reissue. As with Kind of Blue, originals have always been like catnip to collectors, with prices reaching into four figures for truly minty copies. The sad truth is that there were few such copies, because Riverside seemed to churn out more than its share of off-center spindle holes and noisy pressings. Most collectors knew the music from the Original Jazz Classics reissue, which is still in print and allows for an inexpensive way to enjoy great music with a healthy dose of audiophile-grade sound. Analogue Productions’ 45rpm two-LP reissue, which is out of print. was far and away the best way to hear this music for those who also demand great sound. When that version was first released, I doubted that its sound could ever be improved upon. I was wrong. This second release in Mobile Fidelity’s One-Step series takes an incredible-sounding LP up several notches. There is nothing "hi-fi" about the new two-LP 45rpm set: MoFi simply unearths more body and air from the tapes, resulting in a vivid and truly musical re-creation. If the tapes have degraded, I can’t hear any evidence of it on this release. These LPs sound like the best analog recording chain was set up and used to record the performance yesterday. This box set is not inexpensive, but that really doesn't matter, because you can no longer buy it for that price. All 3000 copies sold out in advance of the album's actual release, and many of them went to speculators who are now trying to fetch multiples of the list price on eBay. So now you’ll have to use your time machine to take you back six months, when Sunday at the Village Vanguard was available as a pre-order. Lacking that bit of magic, you'll have to pay dearly for a copy. But you can still keep your ear to the ground and not miss the next One-Step pre-order announcement. Limit two copies per customer.